I just came across this quotation and it is absolute gold! It is from a German poet and playwright, of whom I know nothing other than this article that I am citing, which was written in 1932. His feelings about the medium of radio are now realized in podcasting! This is exactly what podcasting should be. A conversation. Podcasters should be having a dialog with their listeners; both as a component of their podcast as well as in comments on their blog and/or on social media platforms. This man's vision for the then relatively new and emerging technology of radio broadcasting is now being realized (albeit in a slightly different way than he imagined) in the 21st century. 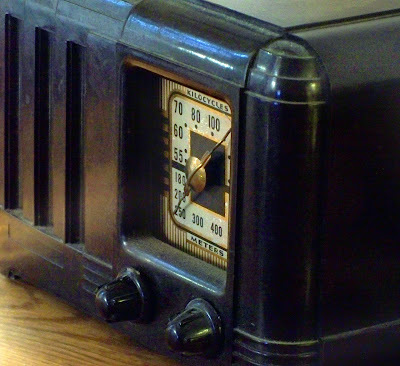 Now I realize that the talk radio format has existed since the 1940s and it brought about somewhat of a conversation, but podcasting can and does take this a step further. How? Well with a podcast the level of interaction and relationship with an audience is much deeper. For instance, one need not be an expert in a given discipline to host a podcast on it. He must only have a passion and enthusiasm for the topic and can use the podcast as a catalyst for bringing together a community of like-minded individuals who can each contribute their own thoughts, expertise and ideas to the discussion. Another example of the enhanced interactivity of podcasting over terrestrial radio is the fact that it is "time shifted", or on-demand content. This may seem counter intuitive so let me elaborate. In radio, in order to participate in a given program, one must be tuned in at the precise time in which that program is airing. And assuming that it is a show which takes phone calls or listener feedback via some other method, there can then be a conversation. But if you are not present at the correct time, even though the opportunity for audience involvement was there, you missed it. But with a podcast, one need not be present at a specific moment in order to participate in a discussion on the topic at hand and can choose how he/she wishes to interact with the content; whether it is by phoning in to a feedback line, posting a blog comment, sending an email or connecting via Twitter. And the conversation can be indefinite, as long as those involved wish to keep it going. There are many more things I could say on this topic, but I think you understand where I'm coming from. I understand that radio has been around for a very long time and I'm not necessarily suggesting that podcasting should replace it. I'm only saying that in a lot of situations podcasting can be a more satisfying experience for all involved. "It is purely an apparatus for distribution, for mere sharing out. So here is a positive suggestion: change this apparatus over from distribution to communication. The radio would be the finest possible communication apparatus in public life, a vast network of pipes. That is to say, it would be if it knew how to receive as well as to transmit, how to let the listener speak as well as hear, how to bring him into a relationship instead of isolating him. On this principle the radio should step out of the supply business and organize its listeners as suppliers. Any attempt by the radio to give a truly public character to Public occasions is a step in the right direction." You can read the full text of Brecht's article here. So what do you think of these thoughts? What are your opinions on this topic? Please post them in the comments below.